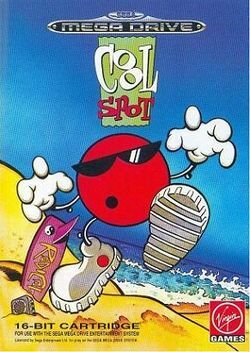 Cool Spot is a 1993 platformer game developed and published by Virgin Games for the Mega Drive/Genesis and Super Nintendo Entertainment System. The game was later ported by other teams to Sega Master System, Sega Game Gear, Game Boy, Amiga and DOS in 1994. The title character is Cool Spot, a mascot for the soft drink brand 7 Up. The title is a single-player platformer in which the player controls Cool Spot. Cool Spot can jump and can attack by throwing soda bubbles in any direction. Cool Spot can also cling to and climb various things by jumping up in front of them. In each level the player must rescue other cool spots, who look exactly alike, from their cages. In order to do so, the player is required to collect a certain number of "spots" that changes (usually increasing) as the game progresses. "Spots" are placed around the level in large quantities. The player's health is monitored by a humorous Cool Spot face that gradually bends forward and eventually falls from its position as damage occurs. Damage is taken by touching enemies and their projectiles and certain other obstacles. There is also a time limit for each level. The game has no save feature but does include checkpoints in the form of flagpoles. If the player successfully collects enough Spots to enter the Bonus Stage after defeating a level, it is possible to collect Continues by grabbing a letter hidden within the stage. Depending on the version of the game, all letters either spell "UNCOLA" (7 Up's slogan), or "VIRGIN" (the game's developer). If a Continue letter is collected, Spot will be able to restart on the level he was on at the time of losing his last life, although his total points will be reset. The Game Boy cover art. This page was last edited on 8 December 2017, at 12:00.